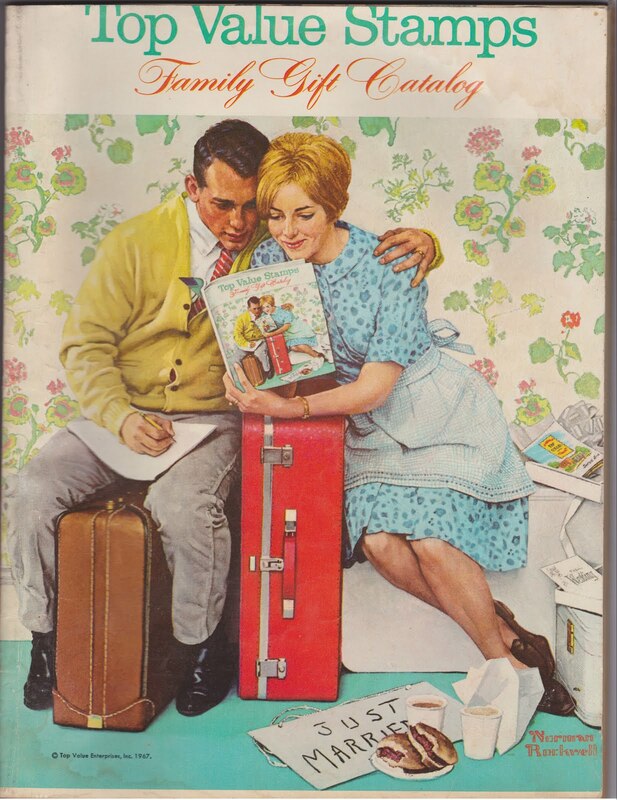 Top Value Stamps was one of larger trading stamps companies during the time period when S&H Green Stamps dominated the market.1 The 1967 Top Value catalog cover, pictured above, featured an illustration by Norman Rockwell, whose paintings were used on at least five other catalog covers for Top Value over the years. Pictured above is the Bates "Flinger" Woven Spread.2 Description: "Striped right, colored right. A fling of fashion for modern living. Machine wash, dry; no press; spot resistant." The spread costs 2.6 Top Value books, and it's not clear whether the young banjo player is included with your purchase. Pictured above: "The Golden Bath"
If you're about my age (say, between 35 and 45), it's extremely likely that you grew up having a grandparent whose bathroom looked a lot like this. Am I wrong? 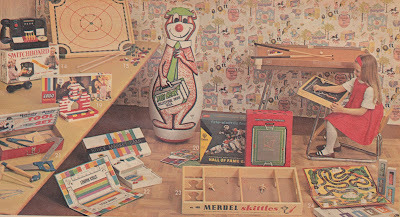 Pictured items include the Mantilla-style Callaway towel set (1.8 Top Value books); the Amesware four-piece bathroom set (plastic tumbler, tissue box, wastebasket and soap dish for 1.2 books); the Brearly Hassock Hamper of quilted washable vinyl (4.4 books); the Borg Meteor bathroom scale (3 books); and the Ames monogram shower curtain (3 books). 2. Some history on Bates bedspreads from P.C. Fallon Co.: "Years ago, Bates of Maine was the world's largest manufacturer of bedspreads. 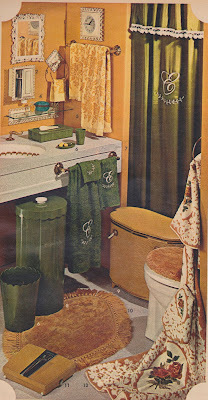 Almost every house had at least one Bates bedspread. Times and tastes changed and those old bedspreads were put in closets and forgotten about. 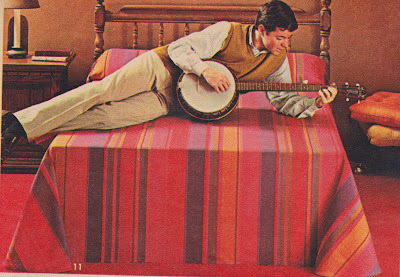 A new generation is now appreciating the classic beauty of the old Bates Bedspreads and people are searching them out. We get many inquiries about the value of old spreads. The old Bates bedspreads have little value as antiques because so many were produced. We tell people to use them and enjoy them as a bedspread." 3. If you haven't seen this Youtube video, AND you have a very dark sense of humor, AND you're familiar with Yogi Bear and the 2007 movie "The Assassination of Jesse James by the Coward Robert Ford" you might enjoy this video. Do you know if Top Value stamps can be redeemed anywhere? I know S&H no longer accepts them - wondering if some place else does? Wow, just going through some of my Mom's stuff and found these books of stamps. S&H, Family Stamps and Top Value stamps. I also found the Idea Book '75, from S&H. Surprisingly a lot of things have not changed. The biggest changes I found were in the TVs and radios. Oh and colors! I have a lot of filled Top Value Stamp Books, filled Eagle Stamp Books, filled Mars Gasoline Stamp Books. Anyone interested? Has anyone found where to redeem their stamp books? Really interested. Would love to know. I ended up on this site because I was researching an ancient looking Cynthia Mills mending thread pack I found in my Aunt Margie's sewing stuff. It dates back to the '30's or 40's. I am amazed at how old this stuff has gotten in my lifetime. About 30 years ago, I would have thrown things like this away. Now I treasure them. I just acquired 15 books of Top Value stamps and I cant find where to redeem them. Green stamps wont accept them..Any ideas? I have two top tv value stamps with fifty on them or they of value? 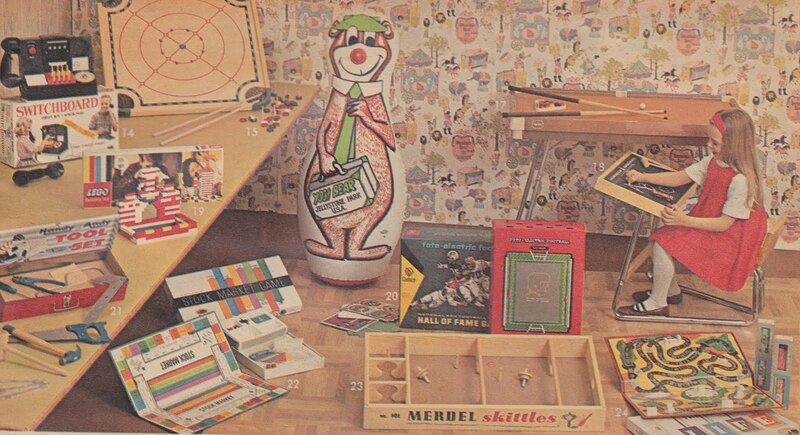 Santa brought me that Handy Andy Tool Set for Christmas in '70 or '71. It kinda sucked. The hammer was way to tiny to pound anything. My parents didn't even buy it: Just used their stamps. My mom always shopped at Kroger's, so she got the Top Value stamps. My mother always shopped at Star Market in the Boston area and they had those yellow colored "Top Value" stamps. My sister was way older than me and had her first child in 1967. My mother used the books of stamps to buy a high chair for her. I'm not sure if she had enough stamps to buy the whole item or if she supplemented it with cash. We went to a catalog store over in Cambridge to get the high chair.